On October 6, Consul General Hong Lei met with State Senate President Sandra Pappas in Saint Paul, the State Capital of Minnesota. 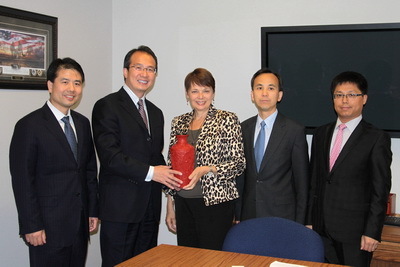 Consul General Hong Lei introduced the cooperation and exchanges between China and Minnesota. He said that the exchanges and cooperation between the two sides in economy, trade, culture and education have made great progress, which is a concrete manifestation of the continuous development of China-US relations. Not long ago, President Xi met with President Obama during the G20 Hangzhou Summit, which provided guidance for the future development of China-US relations. Sub-national cooperation between China and the US have broad prospects. The Chinese side hopes that President Pappas could continue to care for and support Minnesota's friendly exchanges and cooperation with China. President Pappas said that she has received many delegations from China in recent years and has learned a lot about China's development through communication. She believes that both sides could exchange views on many issues such as pension, medical service and education. She praised China's efforts in tackling climate change. She is happy to see that China-US relations enjoy sound developement and the relationship between China and Minnesota achieves great progress. Minnesota welcomes more Chinese companies and students to come for investment and further study.